Unfortunately, there is no simple answer to how much you can expect to pay when replacing your missing teeth with dental implants. As a result, the final cost is determined on a case-by-case basis. To help estimate how much you can expect to pay, there are several factors you need to consider. One of the biggest factors to determine the cost of your procedure involves who will be performing it and where it will be done. If you need to be referred to an oral surgeon, this will increase the cost as you will have to pay both the oral surgeon and the dentist who will handle the restoration process. Not to mention, the geographical location will also influence the price. 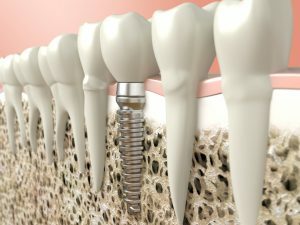 Now, there are many manufactures that make dental implants. The manufacture you choose can either raise or lower the cost. Most dentists prefer to use the Swedish manufacturer that developed dental implants because they have the highest success rate. However, they do tend to cost more than generic implants. Do I Need Additional Procedures? It is not uncommon to need additional procedures prior to beginning the treatment phase, such as bone grafting or tooth extractions. If you need to have a tooth removed or have your bone density increased prior to placing the implant posts, you can expect the price to increase. Will My Insurance Pay for the Procedure? Often, dental insurances will not cover the cost of the implant procedure. However, they may cover certain aspects of the treatment, such as if a tooth needs to be removed. Some insurances may cover the cost of the dental crown, while others may cover the procedure entirely if the tooth was lost due to an accident or disease. You will need to contact your insurance company to see if your dental benefits can be used toward your procedure. As a dentist in Temple, dental implants are among one of the many services we offer. We will create a customized treatment plan and help you understand your options to pay for the procedure. If you are ready to permanently replace your missing teeth, contact Pazmino Dentistry today to schedule your consultation.